The Children First! 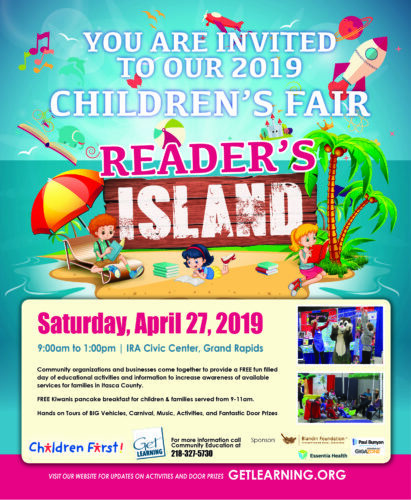 Children’s Fair sponsored in part by Paul Bunyan Communications is Saturday, April 27 from 9 a.m.- 1 p.m. at the IRA Civic Center in Grand Rapids. Admission is FREE and the fun includes music, activities, a carnival, tours of BIG vehicles, and more. Start the day with the free Kiwanis pancake breakfast from 9-11!